The convention will be held at the Lake Las Vegas Hilton Event Center on Saturday, March 2nd, 2019 from 10am-3pm. Tickets are required for this event and can be purchased HERE. Your ticket will also allow you to come listen to any and all speakers and to enter any and all special pug shows! We will announce Vendors and Artists as they become finalized. We will have various fund raising events during the convention day to help benefit Tiny Paws Pug Rescue. We have our raffle which you can buy tickets at the event. 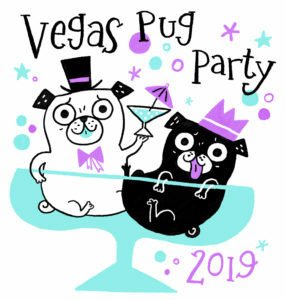 Southern Nevada Pug Rescue will be bringing their pugs whom are available for adoption to the event for you to visit with and fill out an application if you are interested in adopting a pug! We are very excited to have four special guest speakers speaking on Pug and Brachycephalic issues. Everyone who comes to the Convention is welcome to sit in on these talks. Special Pug Shows- All who enter will be in special prize drawing for each special event! 11am-Pug Trick Show- show off your pug’s talents in the Trick Show. 1:15pm-Costume Show- Show off your pug’s best costumes!